"Do you have any mittens?" I asked hopefully, my hands in pain from the nippy air. In only a couple of hours I had gone from 90-degree weather in Los Angeles to chilly Jacksonville in Southern Oregon. And I was freezing. And I was in one of them, the Brenner Building, which dates from 1855. A vintage cookbook and other purchases in hand, I crossed the street to the GoodBean Coffee Company. Cozy and inviting, the GoodBean is housed in the Table Rock Billiard Saloon Building, which was constructed in 1859. In those days, Jacksonville was called Table Rock. A mocha espresso topped with a fluff of whipped cream put me back in shape. And I was off to see more. Next stop was Jacksonville Mercantile, a gourmet food shop where the counter and floors are original. That means from 1861, when it was the premises of Wade Morgan and Company. This shop carries such mouth-watering Oregon products as handmade organic chocolates from Lillie Belle Farms in Central Point, including the lavender-flavored caramels sprinkled with sea salt that have won national acclaim. Another is Cosmos caramel corn from Eugene, free of hulls and kernels and so smooth that it melts in your mouth. I took a break from shopping at Mamma Mia Gelateria, which in 1859 was the Mart in & Zigler Blacksmith Shop. Bacio (chocolate and hazelnut) gelato looked good, but I settled on straciatella--sweet cream gelato laced with chocolate strands. I could look out the window to Bella Union Restaurant & Saloon (1856), which that night was grilling oysters to go with Oregon beer. But my plan was to taste wines at South Stage Cellars, which was once the P.J. Ryan Hotel Building (1856). Opened this summer, the tasting room has a charming garden o ut back and a stock of wines produced from local vineyards, including the South Stage Cellars label, which was introduced this fall. Then on to dinner at the Nunan Estate bed and breakfast (1892), where I was staying. Jacksonville's acclaimed chef, Tim Keller, cooks at the Carriage House restaurant there. Keller is a Californian who came to Oregon after a restaurant career in San Francisco. The restaurant was about to move into new quarters with an open kitchen when I was there. It's named for a building with guest rooms across from the main house, an elegant Victorian structure that has been decorated in keeping with the era. For dinner, I had delicious Dungeness crab cannelloni, made with fresh pasta, local spinach, ricotta cheese and citrus gremolata, which infused it with lemony flavor. Other choices were grilled rib eye steak with foie gras hash, vanilla-larded lamb rack with corn custard, fingerling potatoes and mission figs, and Pinot-glazed duck breast. I was thrilled to find a marionberry in my salad, but Oregonians can have those whenever they want. The wine: Woolridge Creek Merlot 2005 from nearby Applegate Valley. And at the end, warm neighborhood apple tarte tatin with candied fennel and ice cream. That afternoon, I had locked myself out of my room. The man who got me back in was the same man who had offered to carry my bundles as I walked back to the hotel from town. Not until later did I learn that this was Keller, a nice guy as well as an accomplished chef. The Old Library Collectibles & Thrift Shop, 170 S. Oregon St., Jacksonville, OR 97530. Tel: (541) 899-9555. Good Bean Coffee Company, 105 S. Oregon St., Jacksonvile, OR 97530. Tel: 1(800) 486-4036. Jacksonville Mercantile, 120 E California St., Jacksonville, OR 97530. Tel: (541) 899-1047. Mamma Mia Gelateria, 157 W. California St., Jacksonville, OR 97530. Tel: (541) 899-9120. Bella Union Restaurant & Saloon, 170 W. California St., Jacksonville, OR 97530. Tel: (541) 899-1770. South Stage Cellars, 125 S. Third St., Jacksonville, OR 97530. Tel: (541 899-9120. Carriage House restaurant at Nunan Estate bed and breakfast, 635 N. Oregon St., Jacksonville, OR 97530. Tel: (541) 899-1890. One Saturday I walked down my street to a garage sale, expecting the usual odds and ends, worn-out clothing and tired furniture. But this sale was different. It was mammoth, organized to support a peace charity. What the women who staged it had gathered was amazing--treasures from their homes, fine paintings, vintage housewares, hand-stitched linens and collectibles from around the world. I bought so much that I could carry only part of it home. Then I had to return for the rest--and to buy more. On a table of housewares, I found a wire whip like the one my mother used to beat egg whites. In a box under the table, a cookie sheet like an oldtimer from home that had been tossed out years ago. Elsewhere, a tablecloth from Mitla in the state of Oaxaca in southeastern Mexico, with matching napkins. Pretty plates with gilded flowers in the center were from China. Turning over elegantly simple dessert plates, I discovered that they were Royal Copenhagen. Some were chipped, but so what. With an antique pewter tea container from China tucked under an arm, I explored overflowing boxes of books. Deep inside one was a well worn cookbook compiled by members of All Saints Episcopal Church in Hershey, Pennsylvania. Humble but endearing, rich in feeling and memories, it was a prize. The hand-written dedication, dated December 25, 1977, indicates that the book had been a gift to "Bill." It was signed, "Love, Mother." What had happened to Bill? How could he part with such a tender gift? Notes penned alongside the recipes bring them to life. A blintz souffle came "from Selma's brunch." And the baked chicken breasts laden with sour cream that Selma served, possibly at the same brunch, were "delicious--but not on a diet." "You must remember this," accompanies a shrimp curry "that would be good even without curry." And Chinese Chews (cookies) are linked to old memories. "My mother used to make these when I was little," the note says, "but I only found a recipe a few years ago." Date torte has a history too. "Got this recipe from Bob Blodgett's mother--before you were ever thought of." Titled "From His Bounty," the book was printed in Lancaster, Pennsylvania. The names of the contributors accompany the recipes. One of them, identified only as "a friend," provided quite a few. Good recipes too, judging by the Swedish Oatmeal Cookies that I just made. They're buttery rich and chewy, flavored with an almond topping that goes on as they bake. Because they're connected to a real Christmas story, they'll be especially nice to make for the holidays. Prepare the almond topping first so that it can cool. Combine the sugar, butter and corn syrup in a small saucepan and bring to a boil. Remove from heat and stir in the almonds and almond extract. Set aside while preparing the cookies. Combine the butter, granulated and brown sugars in a bowl and cream together until smooth. Add the egg and vanilla and blend well. Combine the flour, salt and baking soda and sift into the sugar mixture. Mix well, then stir in the rolled oats. To keep the cookies from sticking, line the baking sheet (or sheets) with baking parchment. Drop the cookie dough by teaspoonfuls onto the prepared sheets. Bake the cookies 6 minutes. Remove from the oven and place about ¼ teaspoon of almond topping in the center of each cookie. Do not be generous. The topping will simply run off onto the baking sheet and make the cookies stick. Return to the oven and bake 6 minutes longer, until lightly browned. Let the cookies cool on the sheet 1 minute before removing them. If they stick, loosen carefully with a thin sharp knife, then lift with a spatula onto cooling racks. Repeat with each baking sheet. If using only one, remove the used parchment and line with a fresh sheet for each batch. Makes about 5 ½ dozen small cookies. You can make them slightly larger if you like. I mean cranberry tea. Not cranberry-flavored tea leaves but hot tea brewed from fresh berries. Spiced with cloves, it will be wonderful for the holidays. I tasted this beautiful red drink at a lunch in Bandon, Oregon, a coastal town where cranberries and many other delicious things grow in abundance. The lunch, which took place in a glassed-in picnic shelter by Bandon's crab dock, offered a wondrous glimpse into a way of life where people don't go to the market to buy crab or salmon, they fish it themselves. Where wild mushrooms that cost a fortune in big cities are free for the taking. Where berries don't come in little green plastic containers but in whatever basket you grab to go picking. Richard Iverson, owner/chef of Lord Bennett's Restaurant and Lounge in Bandon, did the cooking. A lot of chefs talk about fresh ingredients, but Iverson sources and harvests many of them himself, like the marinated wild mushrooms that he prepared for the lunch. His own farm yielded pine mushroms and three types of chanterelles, white, yellow and black, that were bigger, meatier and almost unrecognizable compared to the mushrooms most of us eat. His shrimp platter with cocktail sauce was nothing like the usual watery, over-refrigerated shrimp platters that show up at cocktail parties. Iverson used tender, sweet, locally-caught spot prawns. I have never tasted prawns that fresh and good. Dungeness crab appeared in curried crab salad sandwiches on onion-dill bread baked at the restaurant. Fresh-picked berries went into the dessert, a brioche cranberry custard tart with wild huckleberry topping. The recipe was developed by Iverson and Lord Bennett's pastry chef, Rosie Brookshier. The cranberries came from a bog farmed by Iverson's wife, Bonnie. They were ground, soaked in raspberry liqueur for five days, cooked, sweetened and added to the custard. Iverson picked the huckleberries for the topping. And both of them squeezed apples to make fresh cider for the lunch. Bandon is a quiet town with only 3,000 inhabitants, oriented toward fishing and tourism, and proud that it is the cranberry capital of the West. Gift shops with Oregon products line the streets by the boardwalk, a pleasant place to lounge in good weather. Someday I hope to eat at Lord Bennett's. The dining room has a magnificent view of the ocean, and the menu offers Bandon shrimp dishes, crab cakes, crab salad and other local specialties. Meanwhile, I'm making cranberry tea from Bonnie Iverson's recipe. Lord Bennett's Restaurant and Lounge is located at 1695 Beach Loop Drive, Bandon-by-the-Sea, OR 97411. Tel: (541) 347-3663. Combine the cranberries and 1 quart water in a large saucepan. Bring to a boil and cook until all the cranberries have popped. Strain the liquid into a bowl. Discard the berries. Add the orange and lemon juices. Combine the sugar and 1 cup water in a small saucepan. Heat and stir until the sugar is dissolved. Add the cloves and bring to a boil. Remove from the heat and let stand 15 minutes to infuse. Strain the syrup into the cranberry mixture and stir. Serve hot. 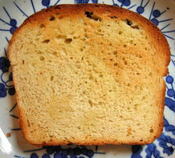 What is so special about a slice of buttered toast? Nothing, unless you baked the bread yourself. And it turned out spectacularly well. Sometimes my loaves split on the side. Sometimes they rise too slowly. The last grainy bread I made was a tad underdone, so that I had to double toast each slice. But this loaf was a beauty, Not my doing. The bread genies were with me that day. I like to butter the bread before toasting. That's why it looks so golden. Afterward, I slather on jam. Any jam will do. I happened to have dark red jamaica marmalade that I bought at a weekend market in Oaxaca. The flavor was sweet and tart, reminiscent of wild berries. It was so good that I want more, which means I'll have to buy jamaica flowers and make it myself, because I don't know when I'll get back to Oaxaca. In the meantime, here is the bread recipe. It's straightforward and easy. Most of the time is spent waiting for the dough to rise. The only real work is 10 minutes of kneading. Combine 2 tablespoons sugar and the salt in a mixing bowl. Scald the milk and pour it over the mixture. Let cool. Stir the yeast and 1/2 teaspoon sugar into the warm water in a small bowl or measuring cup and let stand until foamy. Add 1 cup flour to the cooled milk mixture in the bowl. Stir in the yeast, then beat in the egg. Add enough flour to make a stiff dough. Turn the dough out onto a well-floured board and knead at least 10 minutes, working in flour until the dough no longer sticks to the board. The amount of flour depends upon the moisture in the dough and in the atmosphere. Add more if you need it. Clean and dry the mixing bowl. Oil it lightly. Place the dough in the bowl and turn it to grease all sides. Cover the bowl and let the dough rise in a warm place, away from drafts, until doubled in bulk, which could take 1 hour or longer. Punch the dough down, turn it out on the board and knead a few moments. Let it stand, covered by the bowl, for 5 minutes. Shape the dough into a loaf by rolling and stretching it on the board. Then place it in a greased loaf pan. My bread took so much flour I had to use a 10x5-inch glass baking dish. Otherwise, use a 9x5-inch loaf pan. If that is too small, divide the dough in half and place each half in an 8x4-inch loaf pan. Let the loaf (or loaves) rise until doubled in bulk. Preheat the oven to 350 degrees. Bake them 30 to 35 minutes, or until browned and hollow sounding when tapped on the bottom. If using small pans, check for doneness sooner. Turn out on a rack to cool. Only in California would you find a surfing taco. Oddly enough, not at the beach. 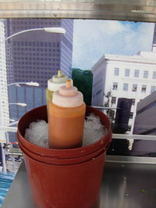 It slides along a wave painted on a taco truck that parks in downtown Los Angeles. 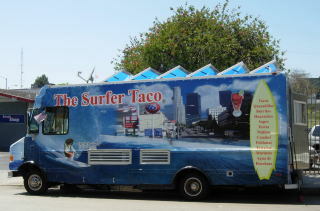 The Surfer Taco pulls up about noon on Witmer Avenue just north of 6th Street and remains there until 10 p.m. every day. Cool and blue, it is refreshing to look at, even if you’re not in the mood for a taco. In that case, you can have a seafood tostada, a burrito, a Cuban sandwich, a quesadilla, burrito or carne asada plate. Obviously business is good, because the truck can afford a glossy brochure that pictures the entire menu and advertises that it sets up taquizas (taco parties) for fiestas. The demographics guarantee success. The truck parks next to a gas station and across from an auto repair shop in a Latino neighborhood. On the other side of 6th Street is the Good Samaritan Hospital and medical complex. The cafeteria there may be convenient, but The Surfer Taco offers fresh air and a more cheerful setting. It’s like a photo gallery, lined on each side with pictures of downtown highrises, with the taco surfing toward them. There are chairs, if you want to relax with your meal. The tacos are small, like compact surfers. My carne al pastor (marinated pork) taco came with two small corn tortillas, onions, cilantro, a lime wedge and two radish slices. Other fillings are carne asada, carnitas, chicken, tongue, beef cheeks, chorizo and chicken with chipotle. Some taco trucks set out a buffet of salsas and garnishes. The Surfer Taco abbreviates that to bottles of red and green salsa in an ice bucket, the way you might serve them at the beach. 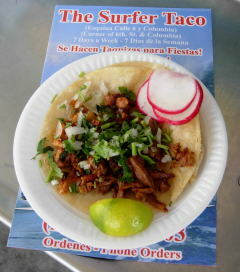 The Surfer Taco, Witmer Avenue just north of 6th Street, Los Angeles, CA 90017. Open noon to 10 p.m. daily. For phone orders, call (213) 265-5203. Argentine Wines: Where Are They? The only problem with Argentine wines is that I can’t find enough of them here in Los Angeles. They are wonderful, and the prices are astonishing—just what we need in today’s painful economy. The other day I tasted wine after wine that I would buy, only I can’t, either because they haven't acquired a distributor or because wine shops in my area don't carry them. The tasting, at the Skirball Cultural Center in west Los Angeles, grouped so many wines from every part of Argentina that in almost 5 hours, I couldn’t get to all the tables. Very few were stratospherically priced. At the high end was Pascual Toso’s Magdalena Toso 2005, composed of 90 % Malbec and 10 % Cabernet Sauvignon. It’s a beauty, as it should be for about $100. Only 40 barrels were made. And there was Terrazas' Cheval des Andes 2005, a blend of Malbec, Cabernet Sauvignon and Petit Verdot, for $74.99. “Gorgeous,” I wrote in my notes. But I used the same word for Quara’s delicate, flowery Torrontes 2008. The suggested retail price for that wine is only $7.99. I’m such a Torrontes fan that I searched the tasting for other good examples. If you’re not familiar with this varietal, it's floral and aromatic, like a cross between Gewurztraminer and Viognier. Most Torrontes comes from Salta province in northwestern Argentina. Bodega Privada Torrontes 2008 from RPB Sociedad Anonima, which in 2007 exported more wine by volume than any other company in Argentina. This one is not distributed here yet. No price was available. Urban Torrontes 2008 from O. Fournier. The grapes for this wine grew at 5,600 feet at Cafayate in Salta province. The 2008 blends in 10% Sauvignon Blanc, but other vintages are pure Torrontes. The suggested retail is about $7. Tamari Torrontes 2008 comes from the Fatima Valley in La Rioja. Lovely aroma and flavor. Only 2,000 cases were produced, and the suggested retail is $16. Pascual Toso Sauvignon Blanc 2008. Aromatic and bright, this vintage is on its way here. But I’m told the 2007, which is in stores now, is just as good. The suggested price is $11.99. Bodega Septima Chardonnay 2007. Refreshing, good balance with a light touch of oak—30 per cent of the wine spent 3 months in oak casks. About $11. Andeluna Cellars Reserve Chardonnay 2005. This buttery, creamy wine spent 12 months in new French oak, then was aged in the bottle for 9 months. The grapes came from 50-year-old vines at 4,300 feet elevation in southern Mendoza. All this for about $20. Graffigna Centenario Pinot Grigio 2007 from San Juan. Good acidity; full bodied, and only $12.99. Finca Decero makes only single-vineyard red wines. A Malbec and Cabernet Sauvignon from 2006, the initial vintage, are $19. Andeluna Cellars Grand Reserve Pasionado 2003 is a Bordeaux style blend (Cabernet Sauvignon, Merlot, Malbec and Cabernet Franc) aged 12 months in new French oak, blended, then aged another 6 months in barrel, then bottle-aged 12 months. It’s lively, with good tannins. The price will be $45 to $50. Bodega Norton Privada 2005, a soft, easy drinking blend of Malbec, Merlot and Cabernet Sauvignon. About $28. My personal favorite was Graffigna Centenario Malbec 2006, $13. It intrigued me with its haunting scent of cinnamon, produced naturally by mineral components. Graffigna’s Grand Reserve Malbec 2005 ($20) has that same hint of cinnamon. Interestingly, the 2004 vintage did not. Malbec is Argentina’s signature red wine. Two more to look for are Tamari Reserva Malbec 2007 for $16 (Tamari makes only Torrontes and Malbec) and Familia Zuccardi’s Santa Julia Reserva Malbec 2007, $12. If these prices are too high, Filus offers a Terra Brisa Malbec 2007 for $5.99. And if that is still too high, go for La Boca Malbec from a line that Filus makes for Trader Joe’s. It’s only $2.99.